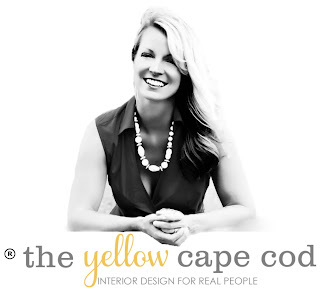 *We currently have openings for new Online Design Projects, please click here for details. This post is sponsored by Select Surfaces. The Blog Cabin Makeover Project is coming along! 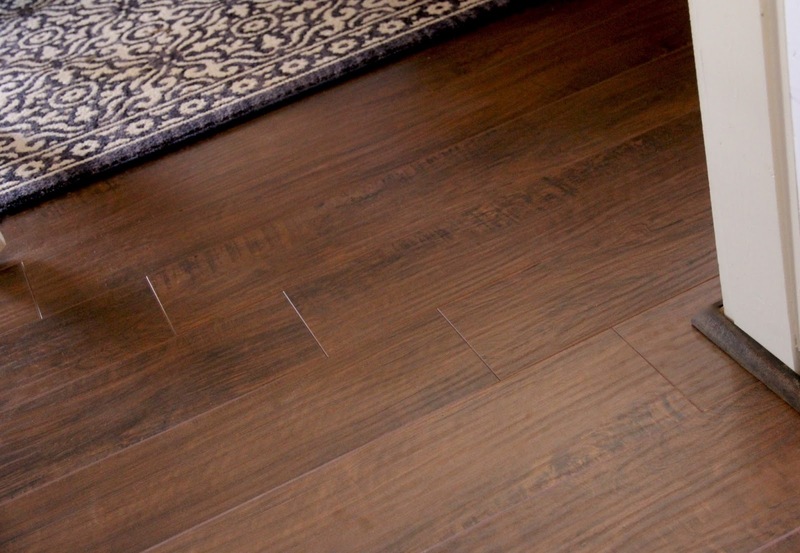 So far, the most dramatic change has been the installation of brand new laminate floors in the Living Room and Bedroom. I'm especially proud of this project, because I did 90% of the work myself. This was the first time I've ever installed flooring and I have to say that it was relatively simple and fun! As you can see, it had wall to wall carpeting that had seen better days. The first night I spent at the cabin, I had my sister come over to keep me company. We were struck with ambition and decided to pull up the carpeting. Using a razor blade, we cut the carpeting into long strips, rolled them up and carried them to the dumpster. The padding pulled up easily, there were a few areas where pet accidents had happened that required a little more attention. The removal of the tack strips and nails around the edges took a little time, but was pretty easy. I wasn't sure what I was going to find under the carpeting. I was lucky to uncover a nice, smooth, level concrete subfloor. Once the carpeting, padding and tack strips were removed, I gave the cement a good cleaning and it was officially prepped and ready to go. I wanted to apply a new flooring material that I could install myself, DIY style. 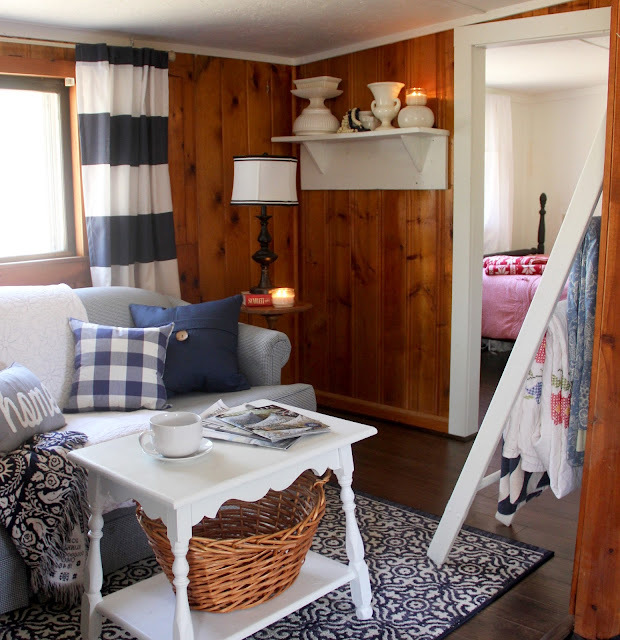 I chose laminate based on my desire for a budget friendly, durable, material that would look beautiful in the cabin for many years. I knew Select Surfaces Laminate from Sam's Club was the perfect choice. 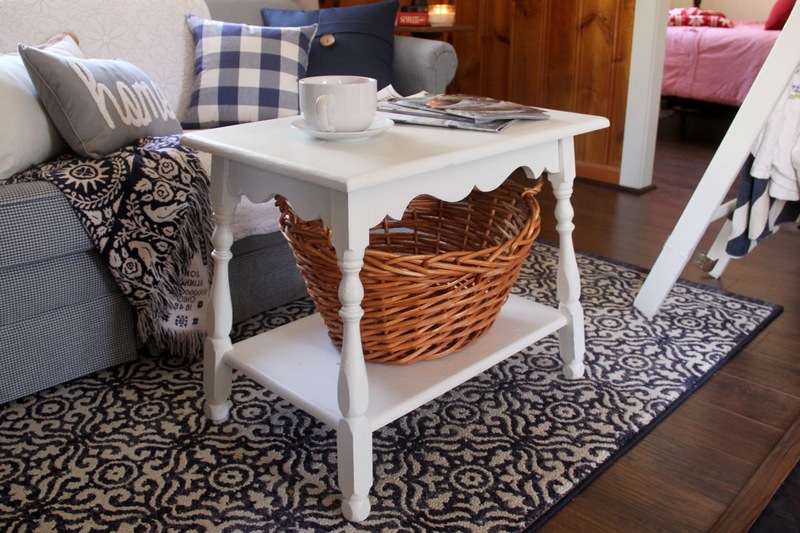 I have Select Surfaces Laminate Floors throughout my home and knew they would fit the bill at the cabin as well. They are designed to withstand "Light Commercial or Heavy Residential Use" which is perfect for my busy, high energy, life loving family! Select Surfaces offered to sponsor this project and sent me several samples from their new Laminate Elite Collection to choose from. 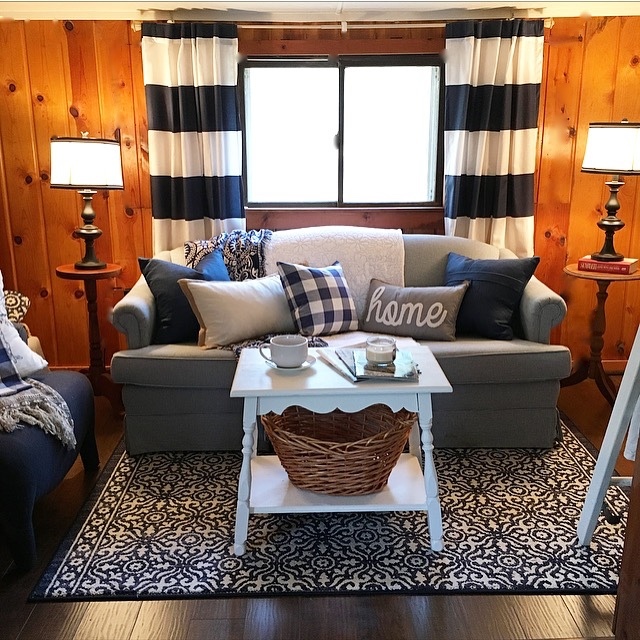 I took the samples to the cabin and laid them out on the floor next to the knotty pine walls to determine which color I liked the best. I made the decision almost instantly to go with the sample that is on the second to left, Mocha Walnut. 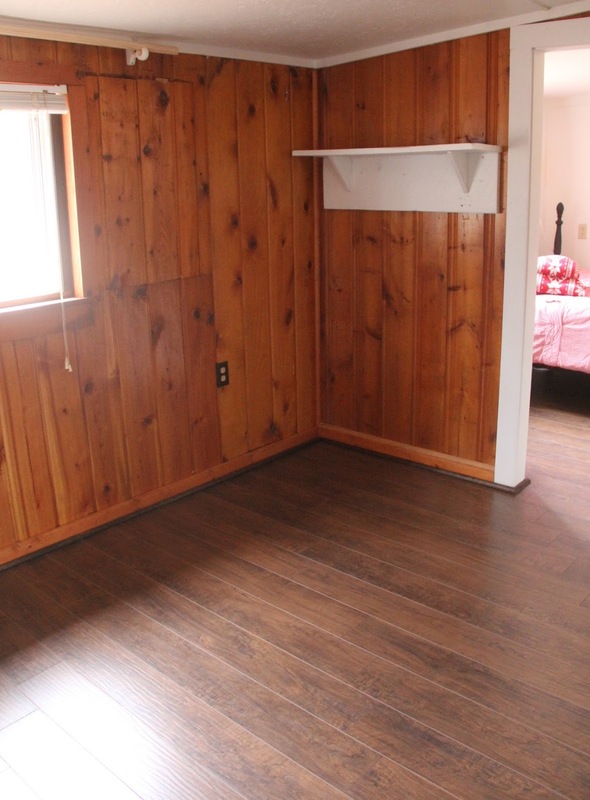 I loved how the color complemented the pine paneling and accentuated the dark knots. I brought in the area rug I bought for the space so I could see the how the new Living Room color palette looked with the different flooring color options. Doing this confirmed that Mocha Walnut was the right choice. Once I had my color selection locked down, I headed to my local Sams Club. I loaded up a cart with Select Surfaces Laminate in Mocha Walnut, a pizza, a pack of muffins and some snacks for the weekend. I stopped at home, grabbed my 14 year old son, and drove up to the cabin in a snow storm. Together he and I unloaded the boxes of laminate into the kitchen. We hung out for a few days allowing the product to rest and acclimate to the environment inside the cabin before installing it. 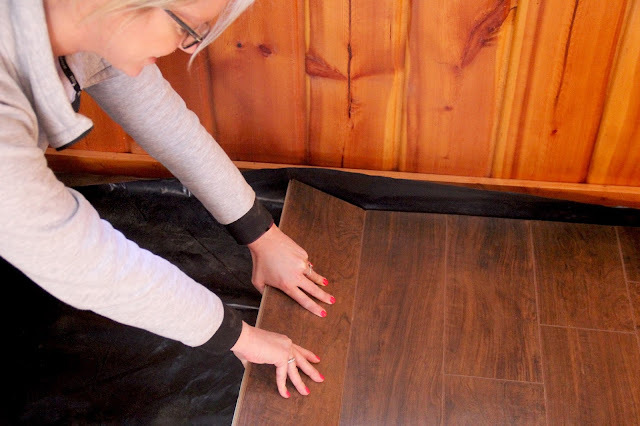 While the laminate was getting used to it's new home, I studied the Step-by-Step Installation Guide and the Project Supply List provided on the Select Surfaces website. I was happy to learn that I could gather all the tools and supplies I needed in one quick trip to a local home improvement store. The first step was to cover the cement subfloor with a vapor barrier. Once that was out of the way it was time for the fun part, laying the laminate. I think the reason the project was so enjoyable was the instant gratification. As soon as the first few rows went down, you could see how beautiful the floors were going to look. As I worked along, I discovered that when locking the boards together, they snap together perfectly if you use a light up and down wiggling motion to put the tongue and grove edges together. A gentle motion works better than using force. The first two or three rows took the longest. Once I got used to the process, I flew through the installation in the Bedroom and Living Room. After all the boards were down, I trimmed the access vapor barrier around the perimeter. The gap left between the floating floor and the walls was intentional to allow for expansion. All of this information and more is covered in the Installation Guide. I used quarter round molding to cover the gap and finish off the look of my beautiful new floors. 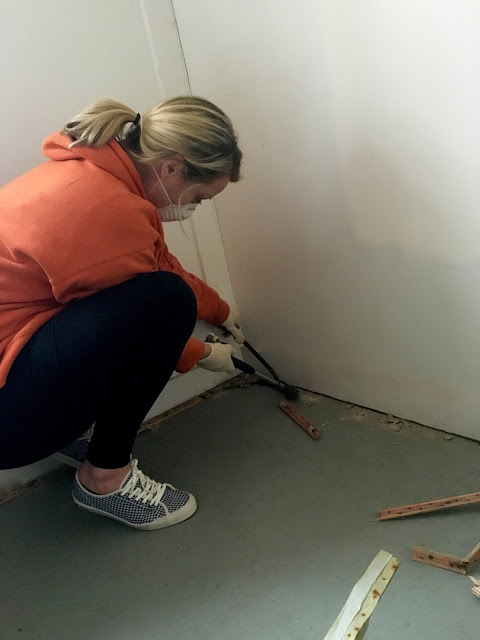 The trickiest part of laying the laminate was making the cuts around the threshold area in between the Bedroom and Living Room. It took a couple of tries, but I got the cuts just right. I was prepared for this and bought a little extra material so I could make some practice cuts if needed. The floors turned out beautifully and, just as I imagined, they completely transformed the space. I may or may not have laid down and rolled around on them a few times in my excitement, I'll leave that to your imagination. In true Designer fashion, the same day I finished the floors I brought in all of the other design elements to finish off the rooms. 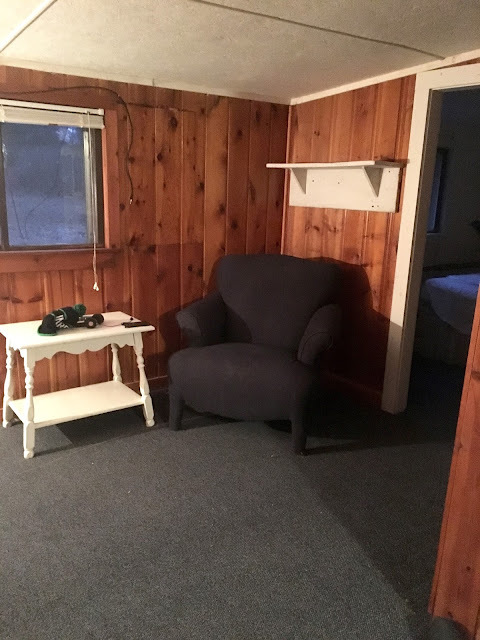 When I pulled up the carpeting in these rooms, I uncovered cement subfloors that were not as smooth as they were in Living Room and Bedroom. *Select Surfaces provided me with the product and sponsored this post. All opinions are 100% and 100% my own. I love reading about this design project. You are such an inspiration ! Great work! I think the colour you chose goes well with the "orangey" walls. I am not a fan of the colour, but I know you said they have to stay. Overall the decor minimizes the wall colour. 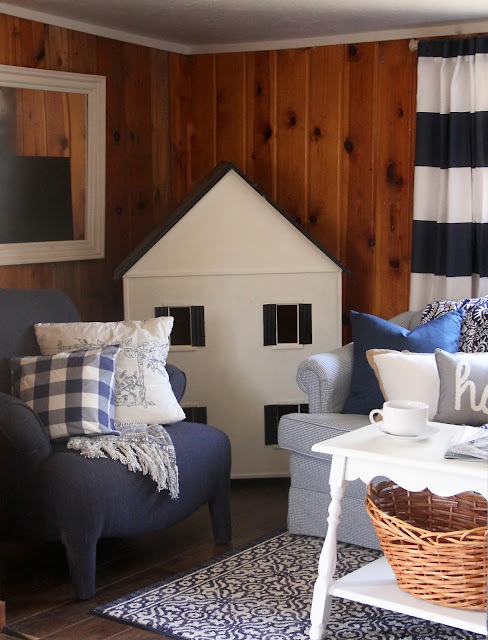 I have similar walls in my sunroom and wish I could white/grey wash them-so the grain could still show, but my husband is not in favour!